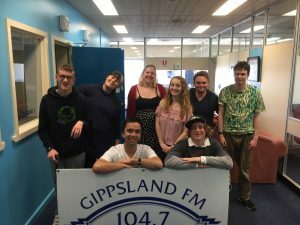 Gippsland FM is recruiting young presenters – we want you to learn the ropes and create your own show. What are our current radio youth programs? Training is free, however all our broadcasters are members and there is a membership fee of $15/year. You can pay this over a number of weeks if you like. Interviews We’d like you to tape at least one interview, this could be with a local sports person, a musician, an artist or politician. Anyone who has something interesting to say. What sort of show can I have? Music, sport, politics, cooking, craft, tech, pop culture – whatever you’re interested in. If you have any other questions just send a Facebook message to GippslandFM. Peter Rennie and Anthony Pavey bring you the Mid Gippy rematch between Traf and Yinnar at 2pm on Saturday.